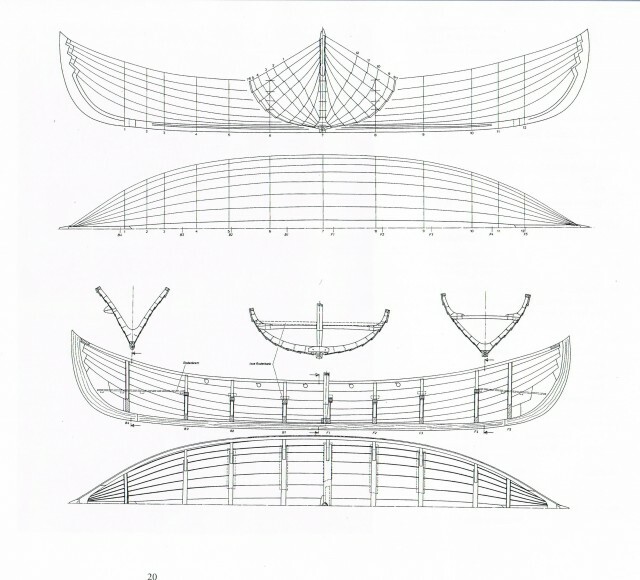 Reconstruction of ancient Slavic boat in Rugen. A significant archaeological discovery was made in the village of Ralswiek on the legendary island of Rügen in 1967. During roadworks an excavator dug out several oak planks from the ground. The road workers took their finding to a team of archaeologists working nearby and those soon began archaeological excavations during which four ancient Slavic ships and a trading settlement was uncovered. The settlement was one of the most important ports on the Baltic coast existed the 8th century. It was proposed that Rujani (an early Slavic tribe) harboured their fleet in the place of archealogical discovery because it is located in the Bay area protected from sea storms. The village of Ralswiek was destroyed by the enemies, most likely by Danes. This is evidenced by the traces of fire and hidden treasure of 2,203 Arab dichroism. The archaeological excavation of the ships was not easy. Excacavated ships had to be buried in the ground because there were no funds allocated by the state for ships’ preservation. The ships were dug out for second time in 1980 to be shown to an international conference. The ships had to be buried in the ground once again as no money was provided by the state to preserve the ships. It was only in 1993 the state provided the funds for archaeological excavations and preservation of ships. The ships were dug out for third time, adequately preserved and a team of ship builders was appointed for ship reconstruction to go ahead. 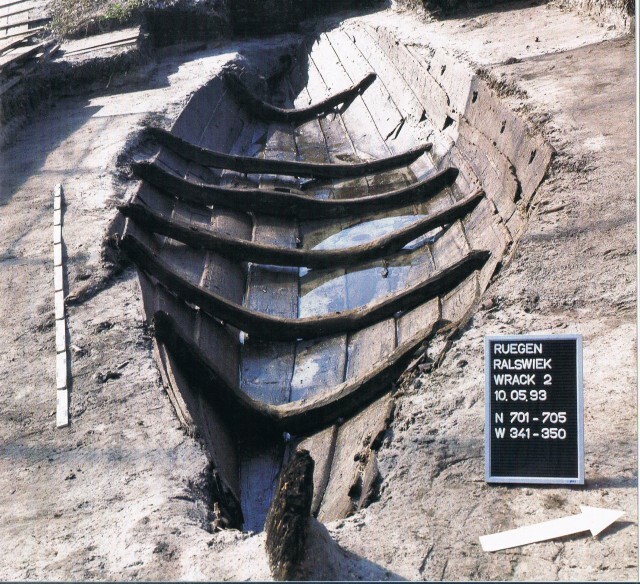 Archeologists estimated that the ships were built in 977 from wood grown in Rugen or Pomorze. The use of wooden dowels showed that the builders of the ship were Slavs. Vikings used metal nails during those times. In 1999, the archaeological community of Mecklenburg released a small but well illustrated booklet describing the history of reconstruction. Two identical Slavic boats were reconstructed one of which can now be seen in Gross Raden. The next photos are from aforementioned booklet. The reconstructors started the project. First, copies of excavated items were cut out from cardboard. Oak from Gross Raden was chosen to construct the boats. To aid in the reconstruction a Danish specialist, Hanus Jensen, was invited. 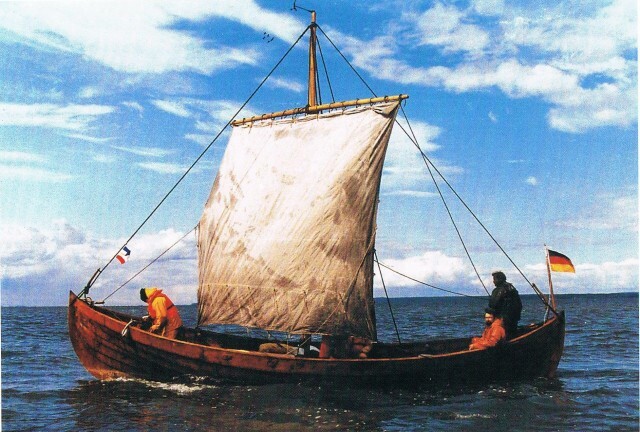 He already had experience in the reconstruction of Viking ship Gedesbi. PS Much of the reconstruction was done using technology and instrument that existed in medieval times.